The New Zealand Bird of the Year contest in full swing! Hosted by Forest and Bird, people can vote for any of 55 bird species that call New Zealand home. Of course the bird with the most votes wins, but pretty much all of them are winners, since the contest is all about raising awareness and funds for conservation. People get really into this! I’ve seen campaign videos, posters, memes, even dancing in silly costumes, all aimed at raising awareness about these amazing birds. Last year’s winner was the kokako (right), a highly endangered forest bird endemic to the North Island (meaning that’s the only place in the world where you’ll find them in the wild). There also used to be a South Island kokako, but there have been no confirmed sightings since 1967, and it’s widely thought to have been driven to extinction by introduced rats and stoats (a big problem in NZ). The kea is one of my favorite birds. 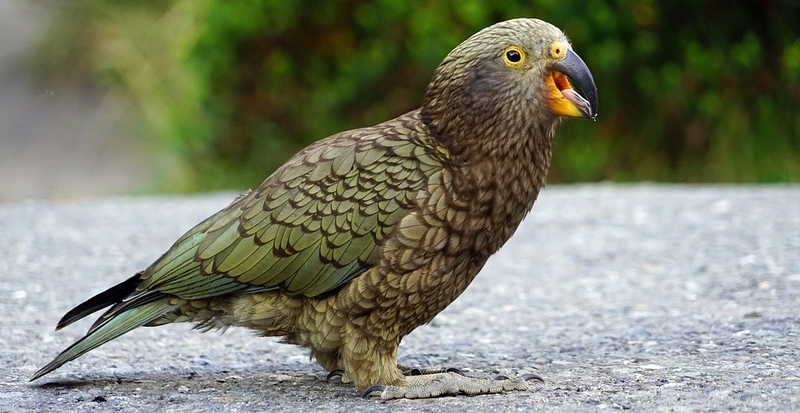 This year, I’m voting for the kea. They’re the world’s only alpine parrot, and they’re endemic to the South Island. Their name comes from the native Maori people of NZ, who named the bird for its trilling keeeee-aaaaaaa call. Standing around a 40-50 cm tall (or about a foot and a half), kea are olive green and brown with a splash of scarlet under the wings, and have a sharp, hooked beak and versatile claws that allow them to manipulate objects easily. They have to be quick-witted and good at improvising to survive in the harsh environment of the Southern Alps. Some of the best places to see them in the wild include Arthur’s Pass National Park, the villages of Franz Josef and Fox Glacier on the West Coast, and up in the ski areas around Queenstown and Wanaka, especially Treble Cone. Last August when I went skiing at TC with some friends, the snow wasn’t great, but the kea were out in full force! The Southern Alps are incredible, especially in Fiordland National Park. But you often can't see them because of all the rain! Kea are incredibly smart and curious (about the same cognitive level as a human four-year-old), and somewhat mischievous. Some folks describe them as the “clowns of the mountains,” and I can personally confirm that they love circus acts. Let me explain. On my first trip to NZ in January 2014, my mom and I drove out from Te Anau to Milford Sound, one of the world’s most scenic drives. Shortly before the end of the 120 km road, you drive through the Homer Tunnel, one of the four places where you can cross the divide of the Southern Alps. Both ends of the tunnel are in enormous glacial cirques with waterfalls all around, and because the tunnel is only one lane wide, you have to wait your turn to go through. That means a lot of cars and buses are hanging around waiting, and therefore a lot of kea are hanging around the cars – they like people and love seeking out new experiences (plus some people feed them, which you should never, ever do!). Once we drove through the tunnel, we pulled off to a side parking area to take photos of the mountains and to watch the kea. Another car followed us, but the driver didn’t pull out his camera. Instead he fished five red balls out of his pocket and started to juggle! Every kea in the parking lot – maybe ten or twelve – hop-skipped over to this guy to watch him juggle, and when he dropped one of his balls, they all chased after it. He had a hell of a time getting it back from them! Shortly afterwards, I learned that a group of kea is called a circus, and I can’t think of a better name. chew and shred rubber on cars, bikes, and shoes – just for fun! A kea tries to steal my mom's camera. Because of this incredible intelligence and penchant for mischief, kea unfortunately don’t have a great reputation among some Kiwis (New Zealanders, not the birds). For many years, there was a bounty on kea because they occasionally killed sheep, and around 150,000 birds were killed before they were finally fully protected in 1986. Despite their protected status, kea are still sometimes deliberately killed by people who consider them to be pests. Kea, like many other NZ natives, are threatened by introduced predators, particularly stoats, possums, and cats. They also can get caught in mammal traps, which they investigate out of curiosity, although the Department of Conservation has now figured out how to “kea-proof” these traps. Lead poisoning is an issue too, since lead apparently tastes pretty good to them. All of this means that there are an estimated 3,000-7,000 kea left in the world, and they need every bit of good publicity and help they can get. So that’s why I’m supporting the kea for Bird of the Year. You can support these amazing cheeky birds too by voting for them (and you don’t have to be a Kiwi to vote – I’m not one). Voting is open until October 23 at 5pm, NZ time – ten days from when this is posted. But that’s not to say that the competition isn’t worth voting for; I think they’re all amazing, and you should take a few minutes to read about them all. Maybe you’ll want to support the whio, NZ’s native blue duck, or the hoiho, yellow-eyed penguins. But kea could really use the support and positivity… so I say TEAM KEA ALL THE WAY!!! You can learn more about kea and donate to their conservation efforts by visiting the Kea Conservation Trust.